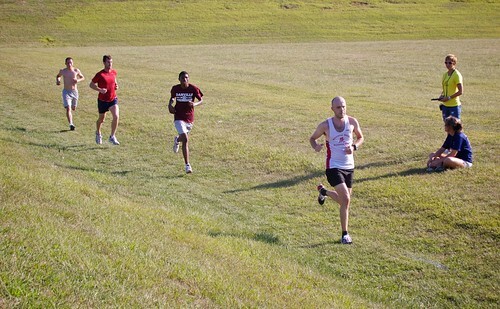 The 2011 DHS alumni cross country race turned out to be nearly identical to the 2010 DHS alumni cross country race. The course is a little bit tougher than a typical XC course, thanks to the addition of a long technical single track trail. There was a small handful of DACC/DHS/SHS runners ahead of me. I finished in 11:47 for the two mile course, just a few seconds faster than last year. I was once again the first alumni finisher, once again finishing a few seconds ahead of Jared Anderson, with Todd Orvis once again a few seconds further back. The major difference was this year I wore a hat. The race was a lot of fun. The whole extended family (parents, grandparents, aunt, cousins) came out to watch. I saw plenty of familiar faces, including my (now retired) high school coach who I probably haven't seen since I graduated. Once again I went to the Custard Cup after the race, where I once again ran into Jared. And my grandparents. 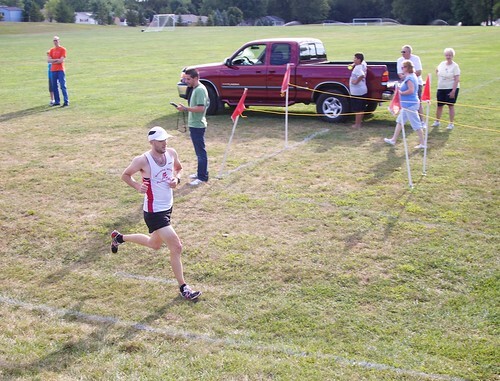 The Danville High School alumni race last August rekindled my passion for cross country racing. Cross country races take place on grass, and while they're usually more challenging that road races, they're usually not quite as tough as trail races. They're a happy medium of speed and technical challenge. 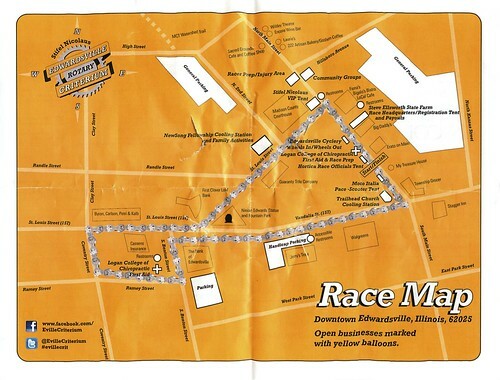 After moving to STL I ran a big cross country race, where I got trounced by the big city competition. Then a few weeks later ran a much, much, much smaller race. Then cross country season (fall) ended, I got injured, I recovered, I got in shape again, and fall is fast approaching. 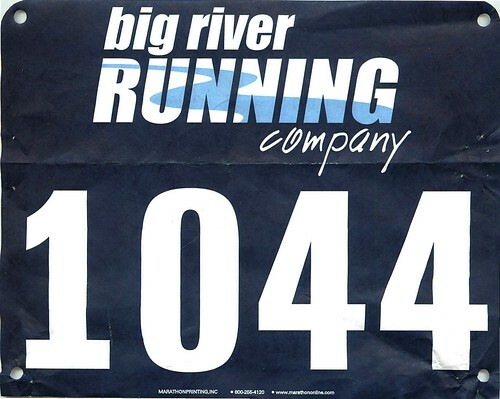 I found a cross country 5K down by the river last weekend and I figured it would be good to get a race under my belt before this year's DHS alumni event. 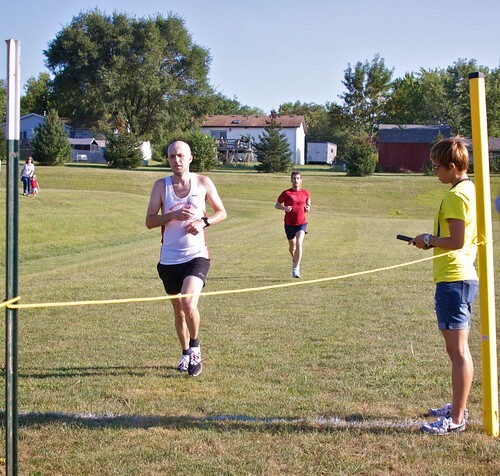 I didn't know what to expect given my two previous STL cross country races had 117 and 9 participants, respectively. I showed up an hour before the race started and there were like 8 cars in the parking lot, so I quickly determined it would be closer to the latter. Many XC courses consist of loops run multiple times, but this course was one continuous 5K path. I decided to run the entire course as a warmup. I didn't want any surprises during the race. There was a risk this would leave me tired for the race, but it seemed unlikely. The older I get the longer it takes me to warmup and on most of my 7-10 mile runs lately I've been at my best during the middle few miles. Participants trickled in and by the time the race started there were 45 runners. Only two or three others looked potentially fast, but looks can be deceiving. 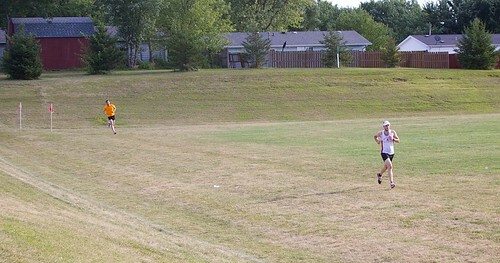 Right from the gun a guy about 10 years my elder took the lead and I stayed on his shoulder for the first mile. 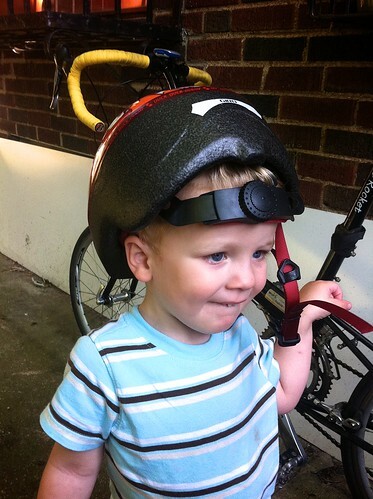 I quickly noticed I was struggling to keep up with him on the downhills, but I had to hold myself back on the uphills. He started to slow around the mile mark, by which point we had a huge lead on the rest of the field). The next uphill we reached I passed him, trying to make it convincing. I built up a 20 second lead pretty quickly, which stretched to 45 seconds by the finish (though I later learned he had to stop and tie his shoelaces, D'oh!). 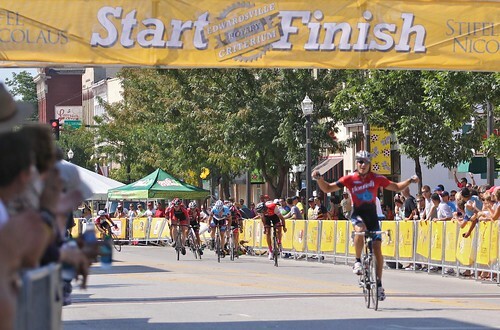 So I won, following up good performances at two bike races earlier in the week. Speaking of bike racing, this is the first foot race I've run using bike racing tactics, which is still weird when I think about it. I didn't go all out from start to finish, as I typically do. I followed other people's moves, played the waiting game, attacked at the right moment, then soloed to the finish line. I don't think I'll have many chances to do that, particularly in bigger races with stronger competition. The awards were Christmas tree ornaments, which was unique. That makes it two races I've won since high school, both 5Ks, one road, one cross country. It was a fun race on a good course. I would have liked to have run faster, but I wasn't mentally prepared to do that all by myself at the front. My next two cross country races will have tough competition, so I'm hoping I can run a bit faster in those. 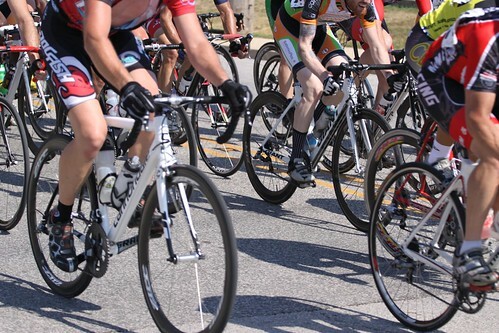 Due to my knee problems over the winter I got off to a late start with competitive cycling this year. I've been doing the Tuesday night practice crits at Carondelet Park the the past six weeks or so. 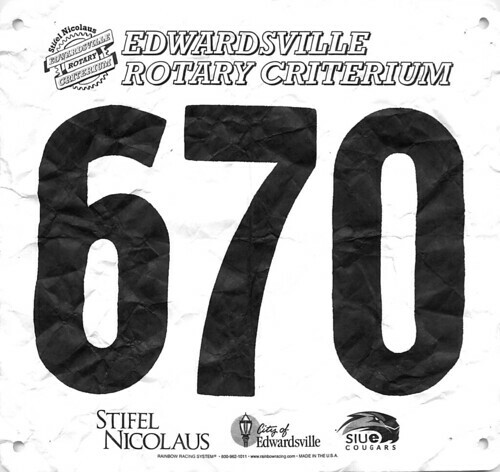 Today I finally rode my first race race of the season, the Edwardsville Criterium. The race started at 1pm. It was 97-ish˚F. A fairly large group started, seemingly well over 50. 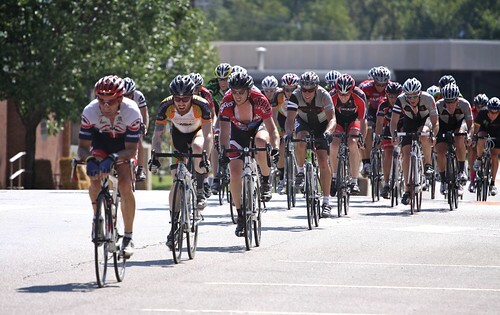 Despite my best effort to get towards the front at the start I found my way to the back of the pack and I spent the first third of the race yo-yoing off the back. I had to close a number of gaps left open by riders in front of me. By the halfway point I moved up about midway through the dwindling pack. The race didn't particularly suit me. It had seven corners, four of them sharp and narrow. Let's just say cornering isn't my specialty. It was flat. I prefer hills. It was hot. I'd take 40˚F over this any day. That having been said, I've been making strides in each of these areas. When the lap-remaining count reached single digits I started moving up a few places each lap. When the bell rang with one lap to go I was sitting comfortably in the top ten and still moving up a bit. Unfortunately my efforts to move up from so far back took their toll and I had nothing left for the final sprint. I got swarmed with about 200m to go and fell to 17th before crossing the line. 42 riders finished. So it was a good race, not great. 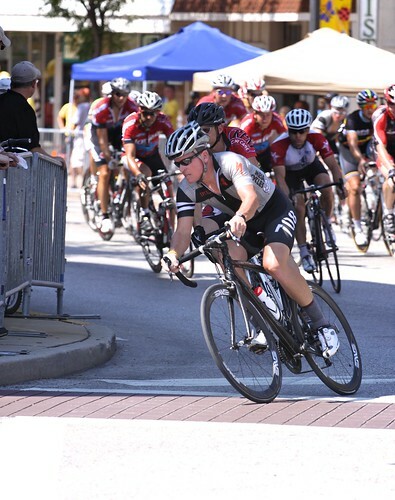 This was actually the first cat 4 crit where I finished with the lead group (it's been over a year since I last raced). It was also the first race where I brought my spare wheels to the wheel pit, though thankfully I didn't have any mechanical incidents so I didn't have to use them. There was one crash about five laps in that I safely navigated around. I don't think anyone was injured. I recognized a number of other rides from the Tuesday night races, but I don't actually know any of them. The only person I knew there was former Wild Card rider Mike, who rode the cat 3 race later in the afternoon. That race had a nasty crash in the final corner of the final lap, with two or three guys flipping over the barricades into the crowd. Yikes! I had a decent race to start the month, vacation, and a handful of 9-10 milers in brutal heat. The good news is that these slogs really paid off, as I'm handling the heat much better now. I'm not getting out of the house as frequently as usual (fewer short rides), but I've been ramping up the longer rides for the first time this year. 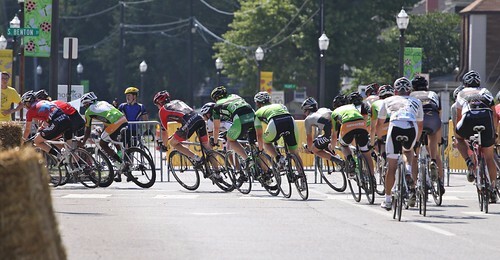 I've been racing the practice crit at Carondelet Park almost every week, gradually improving. 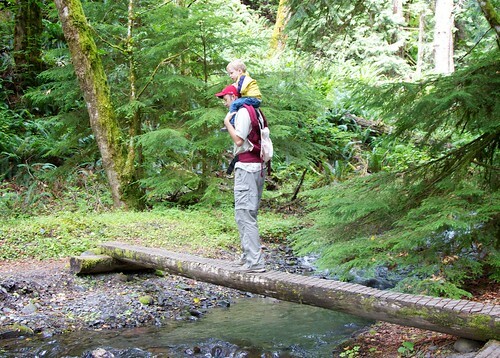 Again, less total distance here, but a bit more quality with some hiking in place of the usual treks to daycare. 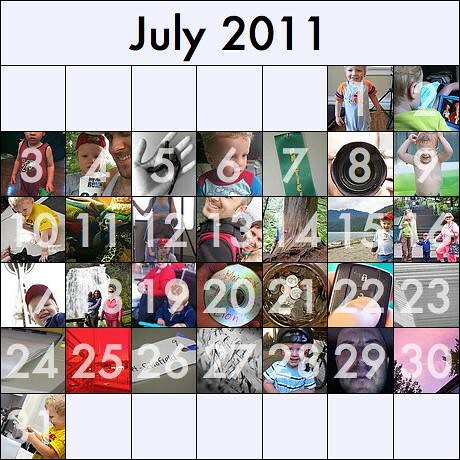 That's right, it's August 5th and I'm writing about a race that took place on July 4th. 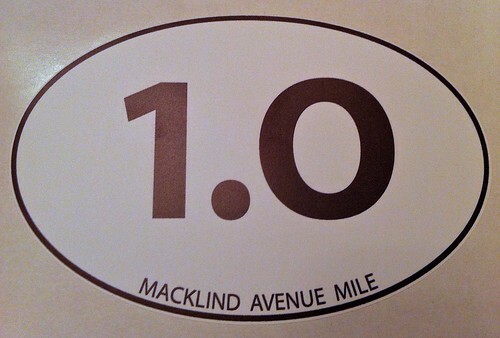 I remember reading about the Macklind Mile shortly after we moved to St. Louis last fall and bing intrigued. 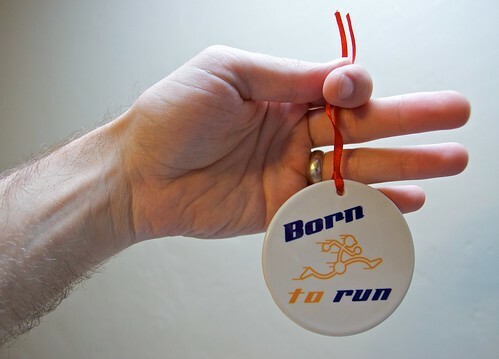 I haven't run such a short race since high school, though I've always kind of wanted to. I thought I would do speed work all spring and be ready for it this July. In reality I did one speed work session on the Wash U Track… five days before the race… and my hamstrings were still sore on race day. Needless to say the race didn't go quite as I had hoped. The one thing I (and everyone else in the race) had going for me was that the race was largely downhill, making the times artificially fast. I started too fast and I paid for it during the second quarter mile, which was slightly uphill. The last half was all downhill, but I was so tired by the halfway point I could no longer push. I just cruised on in to the finish line. I crossed the line in 5:01 (44/318 OA, 9/68 AG), a time I would have been happy with on a flat course. I can't help be be a little disappointed after seeing just how much downhill there was. It was okay, but not great. Maybe next year I'll actually train more appropriately. 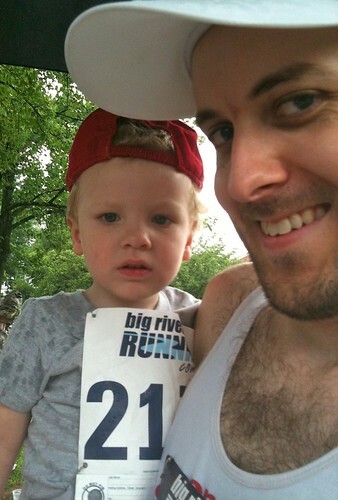 After I finished Will ran his first race, which was very exciting. You can read all about his race here.